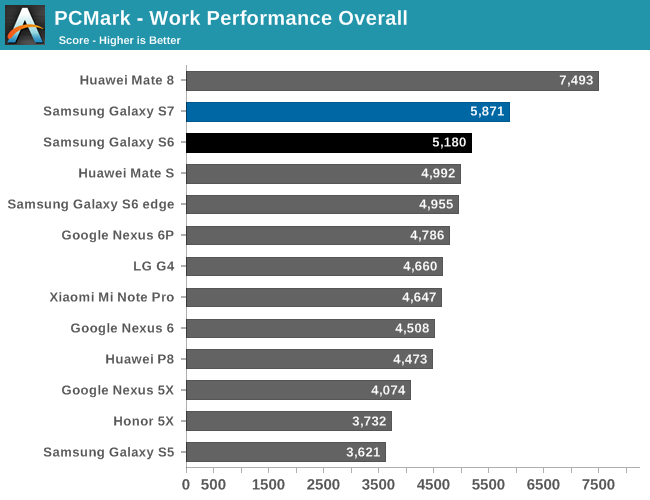 While we’re ready to move on to newer benchmarks for 2016, our system performance benchmarks from 2015 are still going to provide a pretty good idea for what to expect from the Galaxy S7 and Snapdragon 820 by extension. For those that are unfamiliar with what the Snapdragon 820 is, I’d reference our previous articles on the Snapdragon 820. In essence, we’re looking at a 2x2 CPU configuration with 2.15 GHz Kryo cores for the performance cluster, and 1.6 GHz Kryo cores for the efficiency cluster. Binding the two clusters together are some power aware scheduling at the kernel level and a custom interconnect to handle coherency between the two clusters. 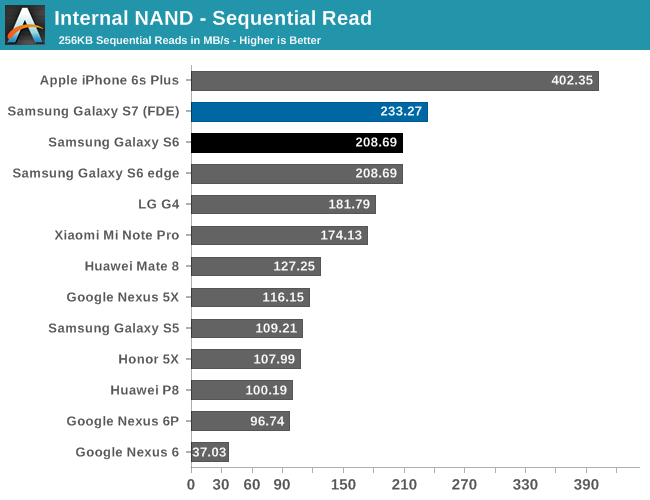 Memory is also improved relative to the Snapdragon 810, with a bump to LPDDR4-1866 over the former's LPDDR4-1600. Of course, there's a lot more to talk about here, but for now we can simply look at how the Snapdragon 820 compares in our benchmarks. Update: As we've had a few questions on the subject, I just want to clarify browser testing. Samsung's stock browser was not included with our Verizon-branded sample phone, nor is it possible to install it at this time. 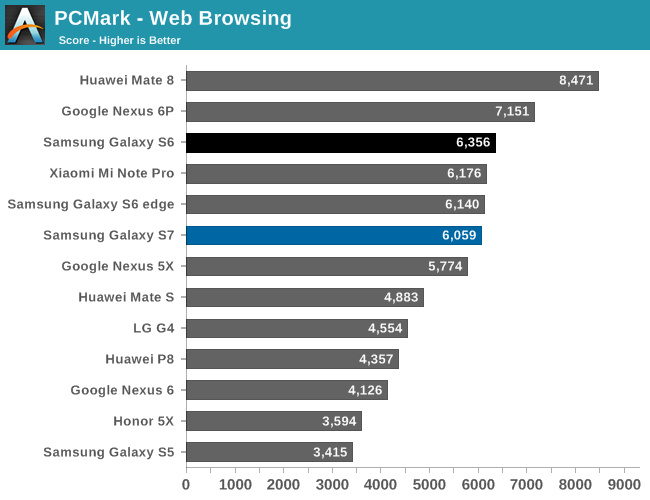 As a result we are unable to test the performance of Samsung's browser. The Verge reports that this is a Verizon decision and that all Verizon phones will be shipping like this; so for these phones Chrome is the de-facto stock browser. 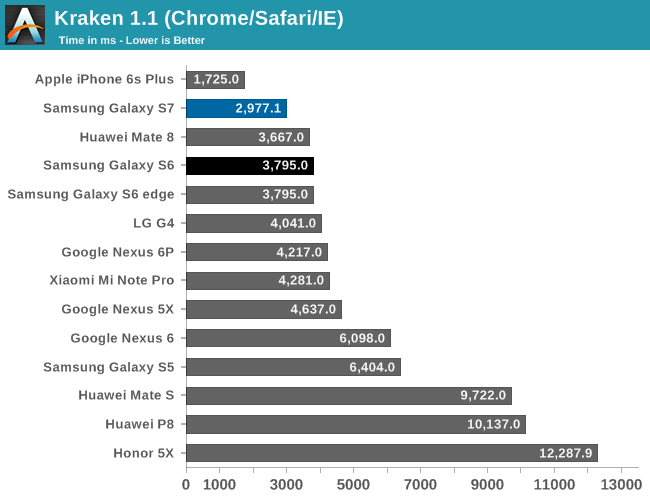 Starting off with our web benchmarks, we can see that in the time since our initial testing of the Snapdragon 820 MDP there have been some major improvements to how well Chrome is optimized for Kryo. 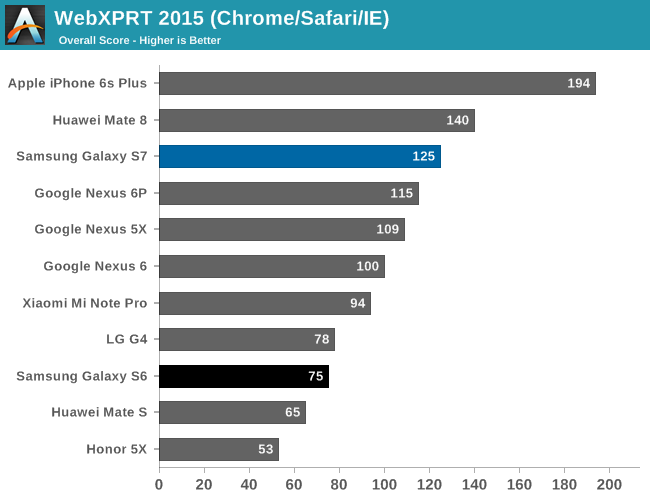 As a result we're seeing results that are almost comparable to Snapdragon Browser in Chrome. 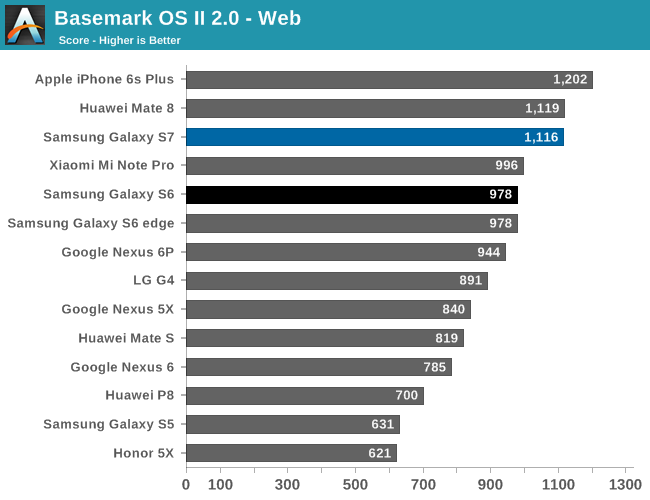 Overall then the Galaxy S7 and its Snapdragon 820 SoC won't top the charts on web benchmarks - Apple still holds an edge here - however the Galaxy S7 puts up a solid fight. 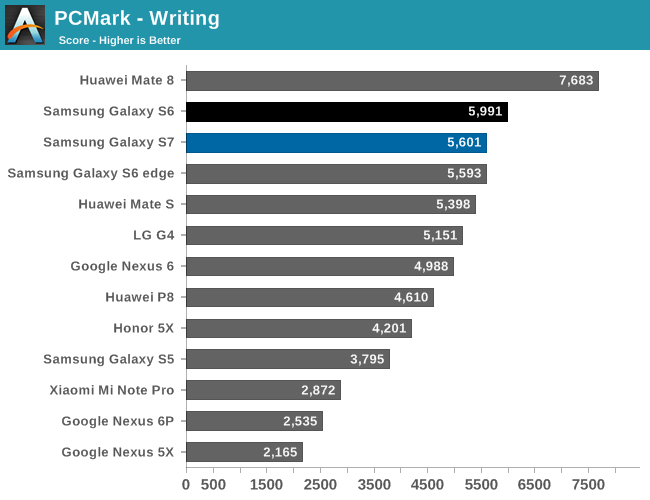 The one drawback here is that the Mate 8 and its Cortex A72 CPU seems to have the edge over the Galaxy S7. 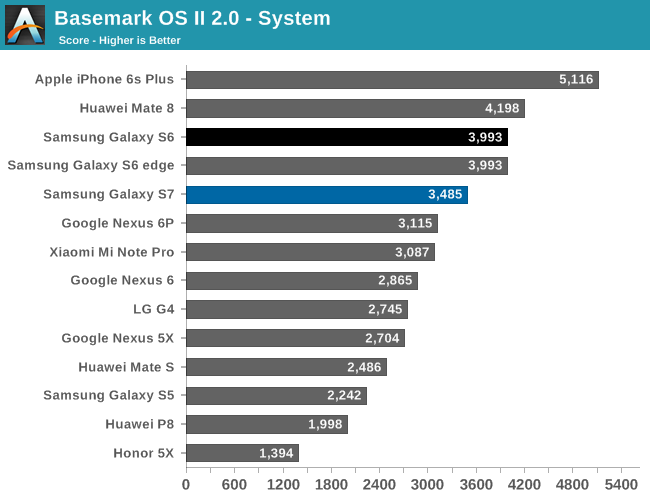 In Basemark OS II the combination of a better GPU, better NAND, and better single thread CPU performance seems to be enough for the Galaxy S7 to approach the iPhone 6s Plus in overall performance. While the system benchmark shows that Kryo isn't quite going toe to toe with Twister, the Adreno 530 helps to narrow the gap in the graphics test. 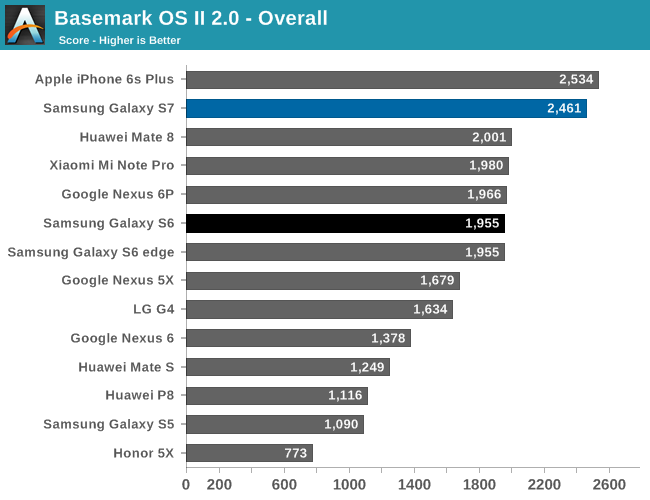 In PCMark, we can see that the Galaxy S7 is mostly comparable to the Galaxy S6. 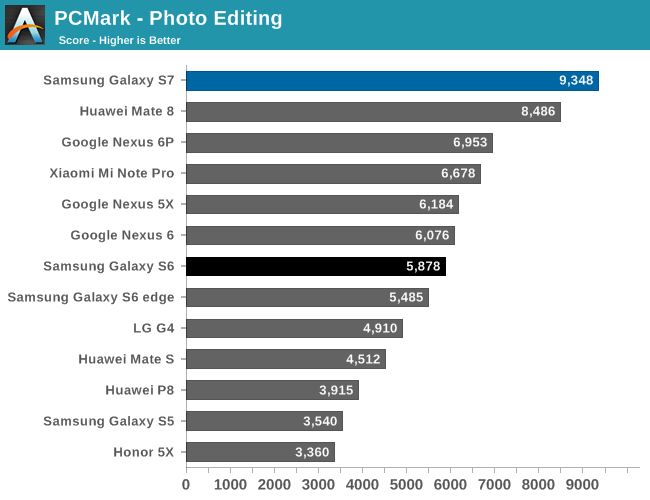 However major improvements in areas like GPU performance help to give it an overall advantage relative to the Galaxy S6 in the photo editing test. 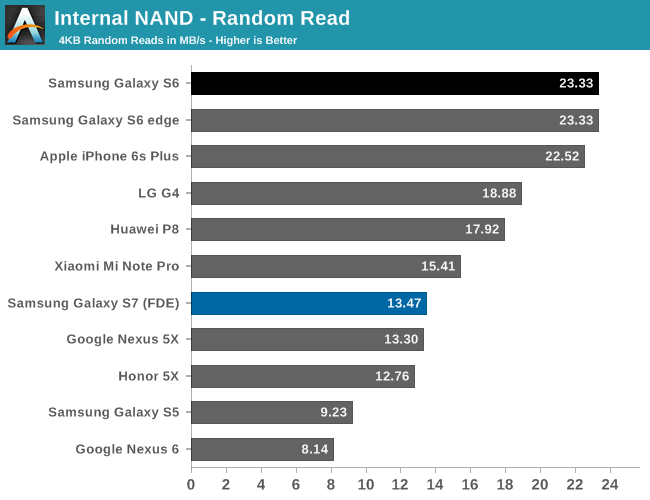 Given that this is basically a test of API-level performance, it's likely that Samsung's frameworks and governor settings lead to mostly similar performance in these tests. 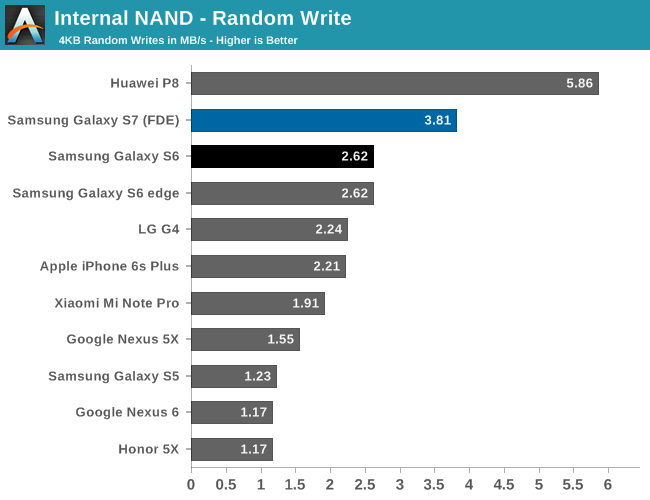 Overall, the Snapdragon 820 appears to provide a pretty healthy bump in performance over almost every SoC seen in 2015, although it's hard to declare a clear winner when comparing it to Apple's A9 or Huawei's Kirin 950. 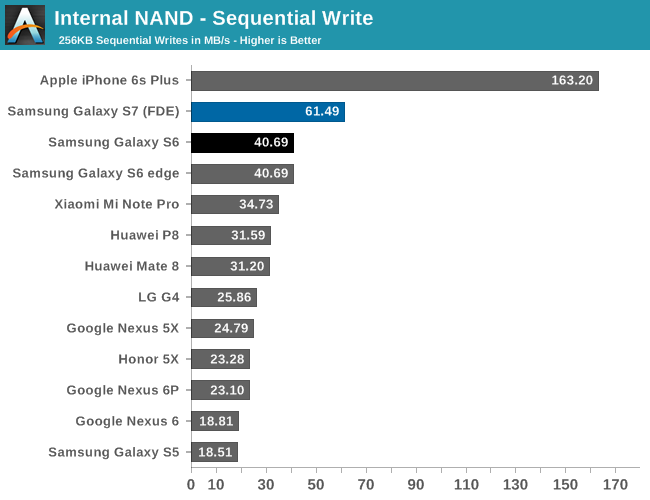 If you glanced at the battery life graphs and the performance graphs above it's pretty obvious that Qualcomm has made some enormous strides here. While not quite going from zero to hero, Qualcomm has come close, and that definitely deserves some credit. If you think about the memory hierarchy, while RAM and cache are important, at the end of the day the most important aspect is the base storage. Even if you have infinite RAM and cache, if your storage is sufficiently slow the user experience is going to be painful for at least the first time you have to load something. In order to test this, we use our standard test of AndroBench with 4 KB and 256 KB reads and writes for random and sequential tests. I went ahead and did some digging around to figure out exactly what it is we’re testing in the Galaxy S7, and it turns out that while the Galaxy S7 storage solution is similar to what’s in the Galaxy S6 and S6 edge, it isn’t quite the same. The Galaxy S7 UFS storage identifies itself as the KLUBG4G1CE-B0B1, which looks to be in the same family and appears to have been released at pretty much the same time as the Galaxy S6 storage solution, but the model number isn’t quite the same. 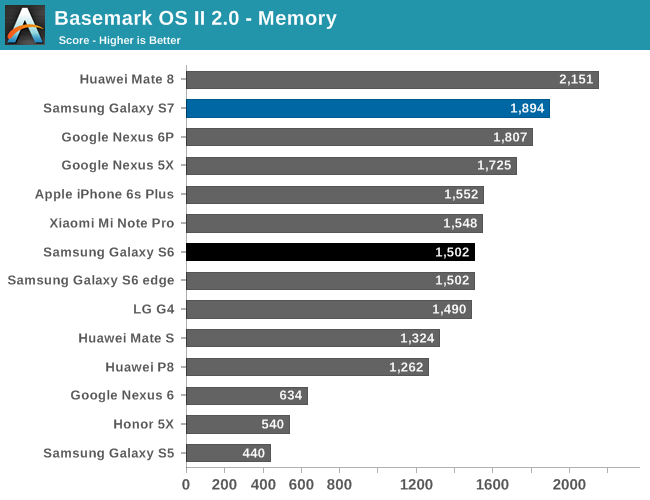 Looking at the performance results, we can also see that the Galaxy S7 is pretty similar to the Galaxy S6 in storage performance at a high level. 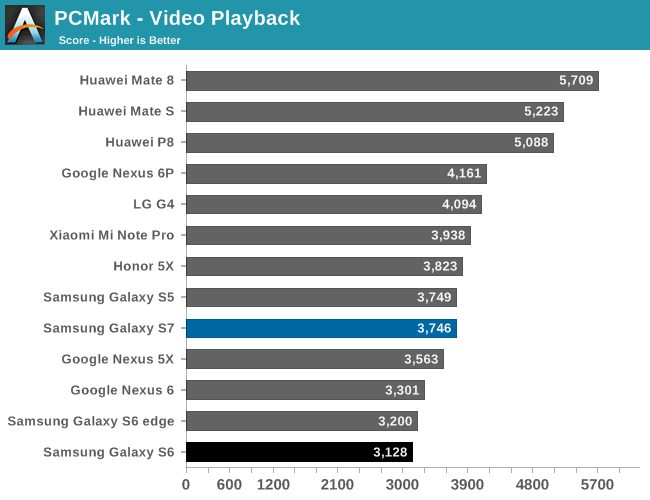 Interestingly enough despite using full disk encryption on the Galaxy S7, we don’t really see a noticeable degradation in performance relative to the Galaxy S6 which is good to see considering the number of Android devices that do have noticeable performance effects when enabling FDE. Oh wow, you had 1 must do here, run GFXBench long time perf and you fail to do so, keeping everybody in the dark about the 1 thing we don't know. Add it for the full review. 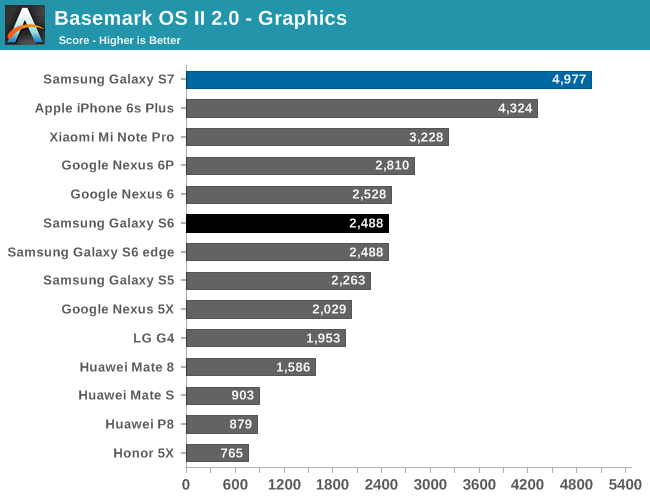 You'll see a GFXBench rundown in part 2. 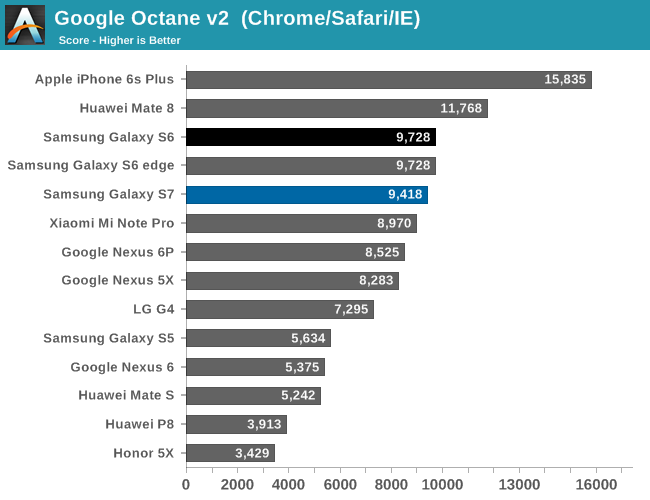 If true that's a bad business decision especially when you did run 2 different battery tests.The fact that the article tries to dismiss the GPU throttling by claiming that mobile gaming is short sessions does seem to suggest a lack of understanding. Sure casual gamers that dgame just to waste time will go for short sessions and less demanding games but for them the perf is also of little to no relevance. Users that should care about the GPU perf are the ones that play longer sessions.